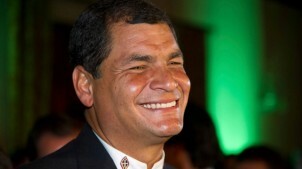 President Rafael Correa, of Ecuador, was re-elected Sunday 17 February 2013 with 57 per cent of the vote. This was a fair election. Environmentalists are afraid that Correa, pressed for money to finance public expenditure, will opt soon for Plan B as regards the 2007 Yasuni ITT initiative of leaving oil in the soil in one part of the Amazon. If not the whole Plan B (extraction from Ishpingo, Tambococha, Tiputini), at least a modfied Plan B (only Tiputini?). He is likely to blame foreign environmentalists and governments unable or unwilling to come up with the contributions equivalent to half the opportunity costs to Ecuador of leaving the estimated 846 barrels of oil of the ITT block under the ground, thus saving a production of approximately 407 million tons of CO2 that would be produced when this oil would be burnt. The external contribution asked for, that would go into a Trust Fund sponsored by UNDP, are of the order of USD 3600 million over a period of 12 years. Also alarming is the irritation shown by President Rafael Correa against local resistance to open cast mining in some regions of Ecuador. The metals in question are copper and gold, the mining firms are Chinese or Canadian, although Codelco from Chile could perhaps also come in. In November 2012, President Correa made the following statement, repeating one of his favourite phrases, “we cannot be like beggars sitting on a sack of gold”, that he attributes (falsely?) to Alexander von Humboldt. He has also talked about the “problem of anti-mining activists” who are against “ecological mining”. More on that in an interesting article here.